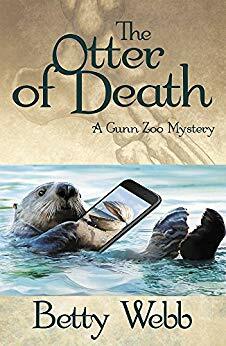 The book so nice, we had to record it (the episode) twice, straight out the Pacific Ocean and packing both nearly a million strands of hair per square inch AND a cell phone telephone, it’s The Otter of Death! Our new direction, where we talk All Lighthearted Mystery All The Time, encounters serious challenges, including technical difficulties, a plot neither of us can quite follow, and a massive heap of animal facts. If you really want to be able to school somebody on the difference(s) betweens puffers and penguins, this may be the book for you! (NOTE: you will almost certainly be asked to leave the store after said schooling.) But if you want to take a ride through a lightly fictionalized version of Santa Cruz, located slightly annoyingly near the actual Santa Cruz, for some reason, and try to get to the bottom of just exactly who could have murdered the guy everybody hated, while not interrupting the dog-walking schedule, then come with us! Any otter choice…would be madness.